It’s an exciting time for your American company. The economic landscape is growing and changing, and with that comes a wealth of new opportunities—like expanding your business operations across the border! The Canadian and US markets share many similarities, making it an easier, more profitable transition for American companies. Canadian consumers share many of the same qualities and traits as American consumers, such as language, taste, buying habits, brand awareness, and more. However, it’s important for US companies looking to gain a foothold in the Canadian market to keep in mind that for all the cultural and economic similarities, there are significant differences, too. To operate in Canada, you’ll need to hire Canadian employees, and those Canadian employees will need to be paid in accordance with Canadian laws and regulations. Labor codes, registering with the Canada Revenue Agency (CRA), and Canadian compliance can be challenging, complex, and time consuming endeavors when trying to smoothly transition your business from national to international. 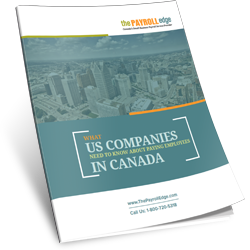 Download this whitepaper to learn more about paying employees in Canada.